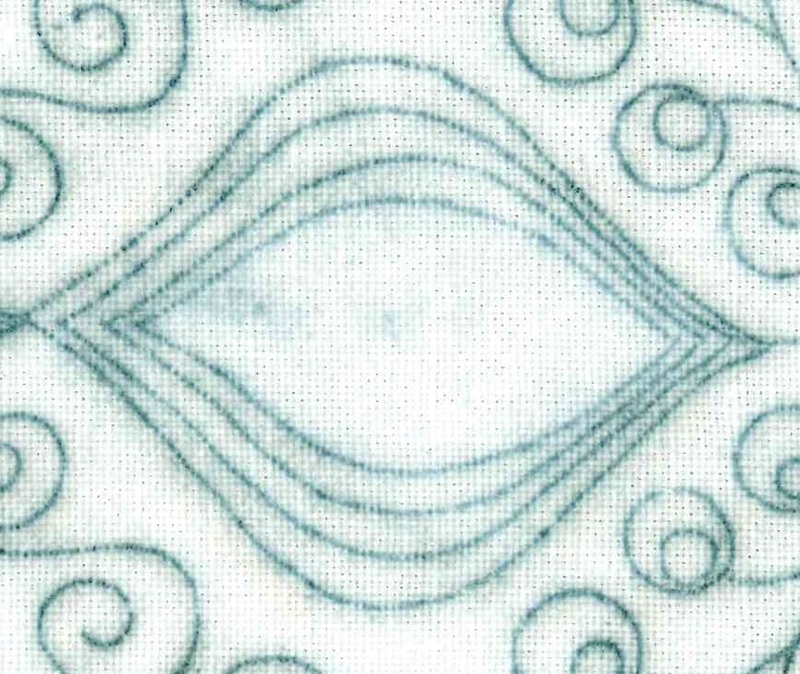 On the oval runner the innermost lines of the shape were deleted to make a larger area for the filling pattern. 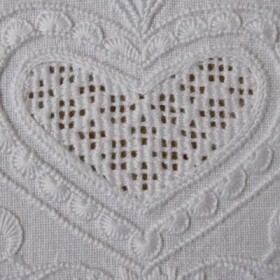 All other lines were covered with Coral Knot stitches. Inside the now innermost Coral Knot lines, Chain stitches were worked. 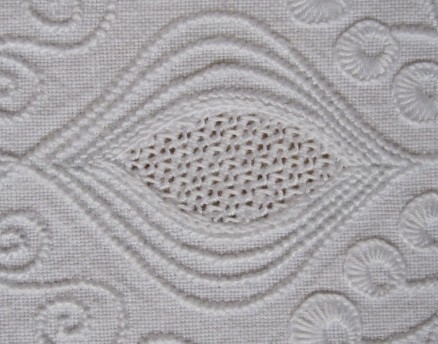 The area was filled with the simple withdrawn thread pattern “Honeycomb Darning stitches” (Basic Principles of Schwalm Whitework, pages 37 and 38). Coton à broder in the following sizes was used: No. 20 for the Coral Knot stitches, No. 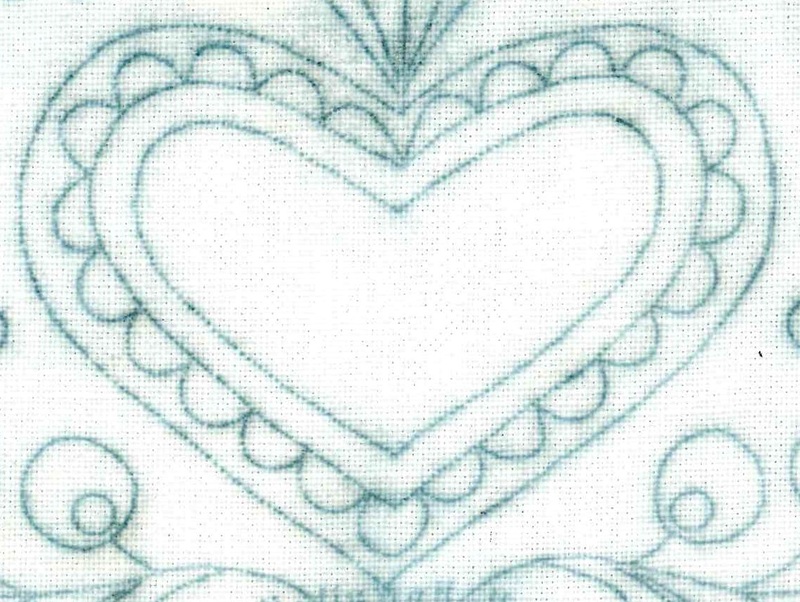 30 for the Chain stitches and the filling pattern. On the rectangular runner all lines were covered with Coral Knot stitches. Inside the innermost Coral Knot lines, Chain stitches were worked. The area was filled with the openwork pattern “Diagonal Cross Filling-French Variation/‘half’”(Openwork Pattern Samplers, pages 32 and 33). Coton à broder in the following sizes was used: No. 16 for the Coral Knot stitches, No. 25 for the Chain stitches and the filling pattern. Again, the innermost line could be deleted to make a larger area for the filling pattern, as the simulation below shows. 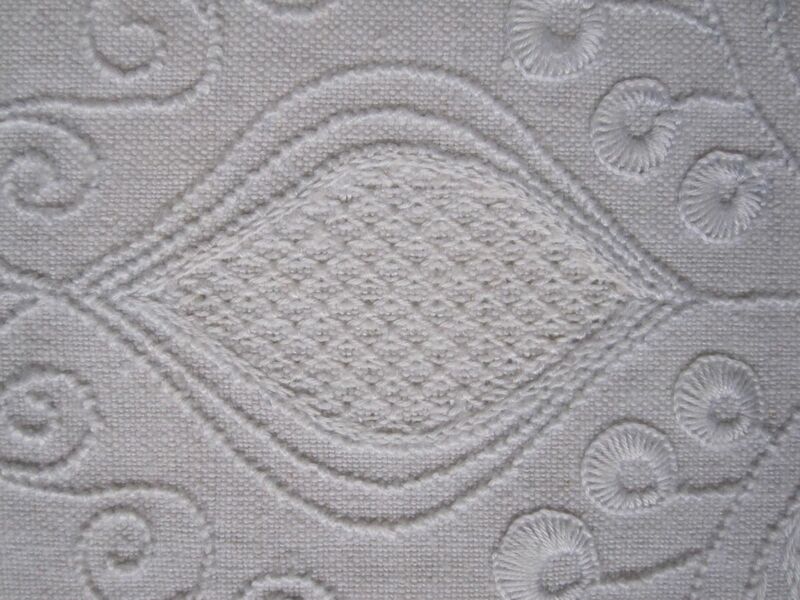 Or, one could keep the design as it is to work a further embellishment between the innermost line and the line of scallops. 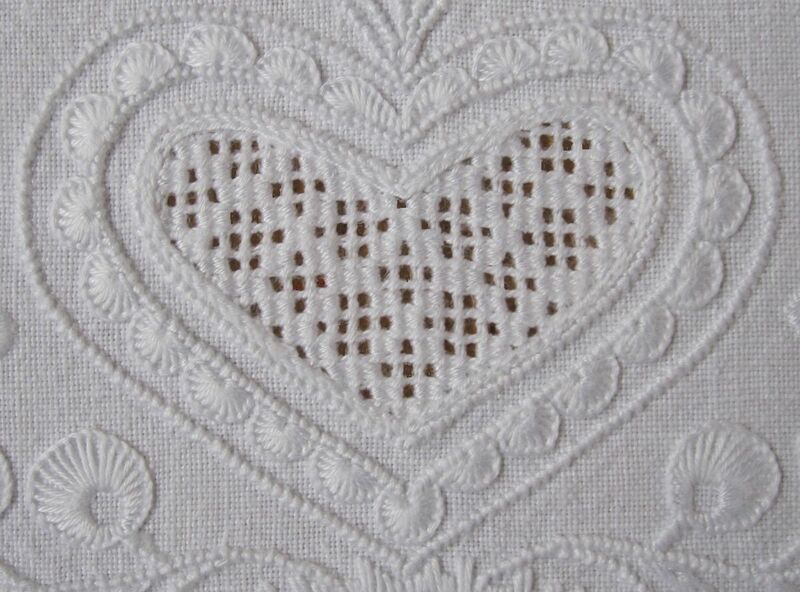 Interlaced Herringbone stitches, a line of Chain stitches placed in the middle, or filling the area with Satin stitches are just a few of the many possibilities. However, in both examples presented here, these areas remain unworked. 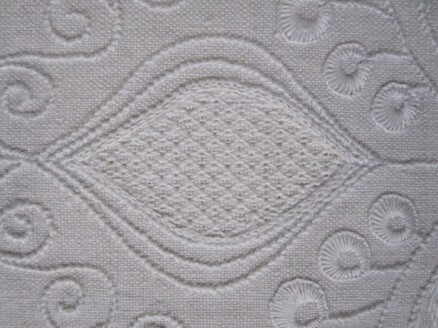 The scallops of both examples were worked with half-eyelet scallops. 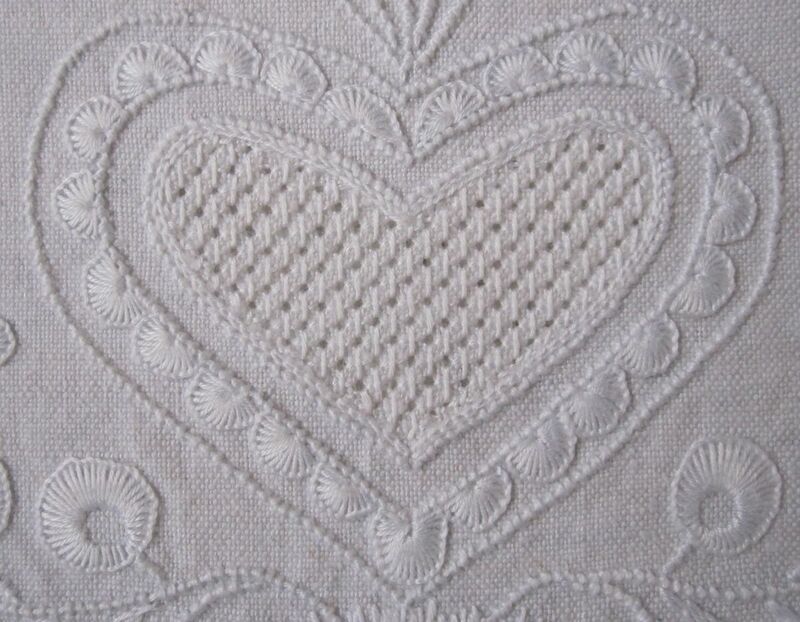 The heart’s center on the oval runner was embroidered with the Limet pattern “Diagonal Cross Filling stitch” (Basic Principles of Schwalm Whitework, pages 39 and 40). Coton à broder in the following sizes was used: No. 20 for the Coral Knot stitches, No. 25 for the Blanket stitches (scallops) and the filling pattern, No. 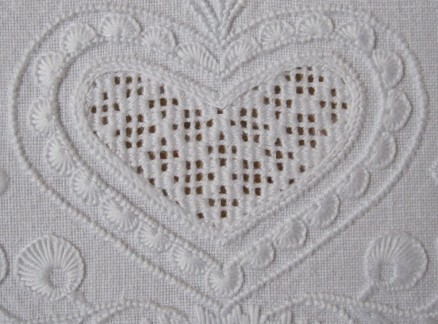 30 for the Chain stitches. 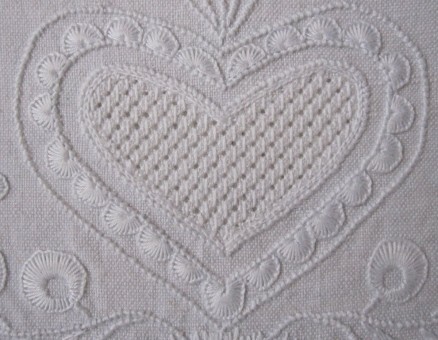 The heart’s center on the rectangular runner was embroidered with the openwork pattern No. 84 (Openwork Needleweaving Patterns, page 45). Coton à broder in the following sizes was used: No. 16 for the Coral Knot stitches, No. 20 for the Blanket stitches (scallops) and the Needleweaving, No. 25 for the Chain stitches, No. 30 the Cable stitch grid. 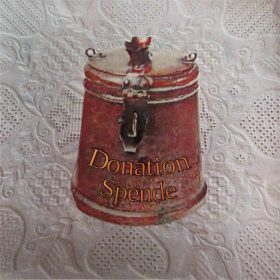 Part (1) of this series can be found here. Part (2) of this series can be found here. This is stunning. I’ve never seen white work before. Thanks so much for explaining how the various pieces are worked. 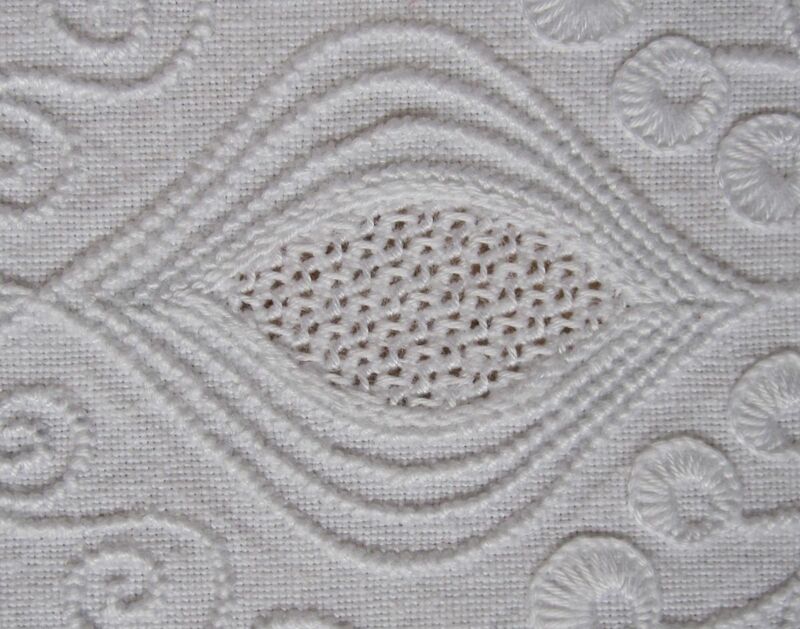 yes, whitework is beautiful, especially Schwalm whitework because of its huge variation possibilities. To learn it, is easier than one thinks. And it brings soo much fun.